Think about the most hateful domestic chores- deep oven cleaning London. Without a doubt oven cleaning will be in your top 3 list. No wonder, it is a messy and extremely hard experience, especially if ignored for longer periods. Yes, hands half covered with grease and strong cleaning detergents are nowhere near to having a light Sunday clean. The domestic products you have at home are unable to efficiently remove burnt on carbon, are causing damage to the oven and contain caustic chemicals. Fortunately, we have an excellent cleaning offer for you – our Professional Oven Cleaning. Our operatives are highly trained and pride themselves in being able, with the correct oven cleaning products, to clean your oven and bring back its sparkle. 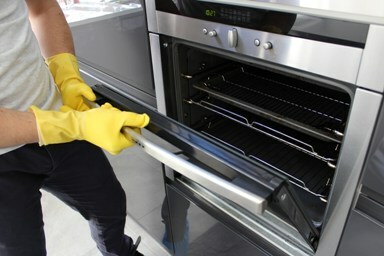 By dismantling all internal rails and thoroughly soaking all internal elements of your oven, they will be able to rid your oven of all traces of grease, food splashes and burnt on carbon which is undeniably difficult to scrub off with your ordinary household cleaning products; especially in all those awkward to reach places. They will thoroughly rinse and wipe everything down before putting the whole thing back together. The work is done within just two hours and appliances are safe and ready to use immediately. Bring Back The Glamour Of Your Oven, Increase Its Efficiency And Improve The Appearance Of Your Kitchen By Simply Contacting Our Company. It will look almost brand new; as if it has never been used by the time our technicians have finished. Max clean offers Professional Oven Cleaning of greatest quality at responsible prices. We clean ovens, hobs, extractor fans, cookers, microwaves and complete ranges. If our Deep Oven Cleaning sounds like the perfect salvation, have no hesitations and get in touch with our company. Our office operatives will provide you with a free cleaning estimate, based on the size of the oven. We recommend you to maintain your oven on a regular basis. For this purpose you can book our regular domestic cleaning service. You are also welcome to enquire a quote for cleaning your hobs, extractor, microwave oven, etc. Contact us for oven cleaning London by telephone: 0207 112 8027.